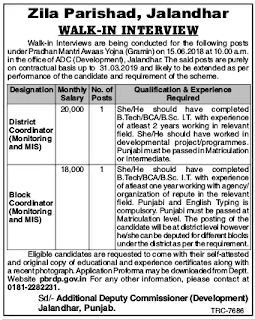 Zila Parishad (ZP), Jalandhar has given a notification of 02 District Coordinator and Block Coordinator Vacancies on the contract basis. The interested candidates can attend walk-in-interview for Zila Parishad Jalandhar Recruitment 2018 on 15 June 2018. ZP Jalandhar Recruitment 2018-19 notification is out. As per the Notification, there are 02 District Coordinator and Block Coordinator Vacancies. The educational qualification is B. Tech/B.Sc. in I.T. and BCA. The age limit is as per the ZP Jalandhar norms. If you are looking for Govt. Jobs in Jalandhar Zila Parishad then this article is going to be very helpful for you. The candidates applying for Block Coordinator Jobs in Ludhiana should have passed the BCA/B. Tech/B.Sc. IT with experience of at least one year (for Block Coordinator) and 02-years (for District Coordinator) Vacancy working with the agency in the relevant field. Punjabi must be passed at matriculation level. English and Punjabi Typing is compulsory. Age Limit: The age limit is as per the ZP Jalandhar rules. District Coordinator: Rs. 20000/- Per Month. Block Coordinator: Rs. 18000/- Per Month. You can attend walk-in-interview on 15.06.2018 at 10.00 AM in the Office of ADC (Development), Jalandhar along with your self-attested and original copy of educational, experience certificates and a recent passport size photograph. Date of Interview: 15 June 2018.